Edited 7 time(s). Last edit at 08/18/2011 03:34PM by Ohnivy-Drak. Um... you realize there is another one up there, no? #1 is still intact. The triangle one .. only the nub is there. Do you really want these? I have prob. close to 50 if you include the boundary markers. well, I'm obviously not too good at finding these things. Gives me another reason to go back up to Clouds Rest. Never looked for one at Eagle Peak. If a summit/peak is in the GNIS (Geographical Names Info System) database, I bet there's an official benchmark. Edit: the original idea for this thread was to get as many as possible, from lots of different people, to see where we've all been. Then a super guru like you could fill in the missing/obscure ones. Edited 1 time(s). Last edit at 08/18/2011 12:21AM by Ohnivy-Drak. I realize, of course, the possibility that many people don't hunt for these, so won't have the photos. Very good idea. But I can't get the "Insert image URL" feature to work. Here's YOUR photo of the Cloud Rest bench mark. Edited 2 time(s). Last edit at 08/18/2011 03:56PM by plawrence. Thanks, it is pretty simple. Now I know to choose "copy image url." Here are two links to bench mark stuff. The second one has datasheets which tell you location and a lot of info. For a few they even have pictures. On USGS maps you can see the bench markers. If there is a triangle then there should be a bench marker. The links above may help to determine if you can find it or not. Many peaks do not have bench markers. What I have is listed below. If you want to see any or all of these just let me know. Good luck hunting... I'm missing a few myself..
Obviously there isn't much interest in these. Sorry, I had forgotten that I asked that question about bench markers before. Thanks for the tip on the triangles. Although not all of them are provided/seen on the USGS maps, ie Nevada Falls & Watkins. The "X's" mark the high points, but that's not necessarily where the markers are (i.e. Watkins again). When the map shows "BM 8161" near Murphy Creek TH along Tioga, does it mean we should find some type of marker there? Just clicked on the second link (NGS) that you provided, lol. First search filter: Mariposa County, then Tuolumne. The last column, "Description," could use some improvement. No listing for North or Basket, for instance. But in all its glory, I see a listing for "EAGLE." I'll punch those coordinates in and give it a go sometime. There are quite a few groups of rocks up there, so who knows which one. It doesn't have to be the highest point. Edited 1 time(s). Last edit at 06/13/2012 10:03PM by Ohnivy-Drak. Last time I was there I hunted and hunted and hunted... and found nothing. I even went WAY down towards Middle Bro... and just found absolutely nothing. Prob. need to send Bearproof there to find it for us. He has a nose for those thangs. Once the leaves a start a changing... I'll do an overnight up there ... and look around. Here's the link to marker and info: Eagle BM. 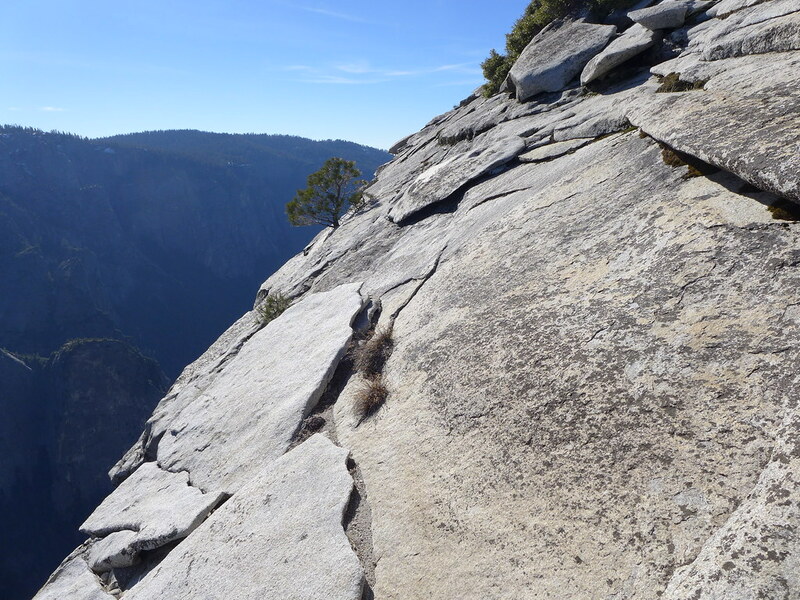 The "green" symbol on "scaredy cat" indicates "marker found"
Why isn't Taft Point marked on the "scaredycat"? HR0764 looks to be Oh My! Don't see El Capitan. But I'm seeing a pattern of sorts. Glacier Point disk is marked by a triangle, while Basket's and North's have +/x. I bet Taft Points marker has the +/x (which it does). I'll guess YP has a triangle (and waddaya know...). So the two links you provided above only give the locations of markers with triangles. The other ones must be in a different database, or were used for a different reason. I'm sure others have already figured this out centuries ago, lol. And when you look at the topo maps, that's exactly what occurs. So no wonder nada on Polly. If a location is marked with either symbol (x or triangle) on the map, it means a round discs *might* be there. But if a location is not marked with a symbol, that means don't bother looking there. Edited 1 time(s). Last edit at 06/14/2012 09:51PM by Ohnivy-Drak. Yup. I knew about EAGLE. Until I see it ... I don't believe it's up there. Well hell...is that actually on one of the domes on the system, the highest point, or along the road. LOL. Thanks! At least there's definitely a good reason to go back! Along with the cascade that spills from Lower Lake. btw, what are the odds the Eagle marker is somewhere in the meadow? Or somewhere along Eagle Creek? Edited 1 time(s). Last edit at 06/14/2012 10:25PM by Ohnivy-Drak. That makes sense. According to official records, it's supposed to be sitting on a boulder - recorded in 1955 or so. Maybe that boulder has fallen since. Edited 1 time(s). Last edit at 02/19/2013 08:56PM by Ohnivy-Drak. I realize this thread has been inactive for many years, but I'm hoping I can get some information from someone on the benchmark that is listed below as being on El Capitan. Does anyone have a photo and an approximate location on the quad map for it? Hi. So... there are sort of two on El Cap. Both are sort of on The Nose. One is at the base... and one is at the top... the brink... along with a small lock and clip. The one at the base is long gone... only the nub is still there. The one at the brink ... I can't say... it was there in 2008 when I visited it. I've been meaning to go back but ... it's a long way down from the top. Anywho... if you go... lemme know the state of it please and thank you. on the tip top of El Cap and have been up there many many times. that so many enjoy and find interesting. What's annoying is that when you search for it in the NOAA Database, it's not listed. Or it's not obviously named. Will likely make another trek out there in the week or two. Have never taken the trail from Yose Crk CG. If lucky, will come across a few climbers again. Old maps seem to indicate once upon a time, there was some type of marker at the high point 7569. Easy to take, or maybe struck by lightning? Just like the one at Eagle. This one annoys me more than any of them. I've offered to be part of the reset team, but it's been met with silence thus far. Edited 1 time(s). Last edit at 06/29/2018 11:56AM by Ohnivy-Drak. I haven’t finished my El Capitan replica yet, but I did find a map which shows the location of the benchmark at the top edge (with matching elevation) and the one that was vandalized at the base. Is the 7042 BM as close to the edge as the map indicates? Do you happen to have photo that show the benchmark in relation to the edge or the general area/view from up there? 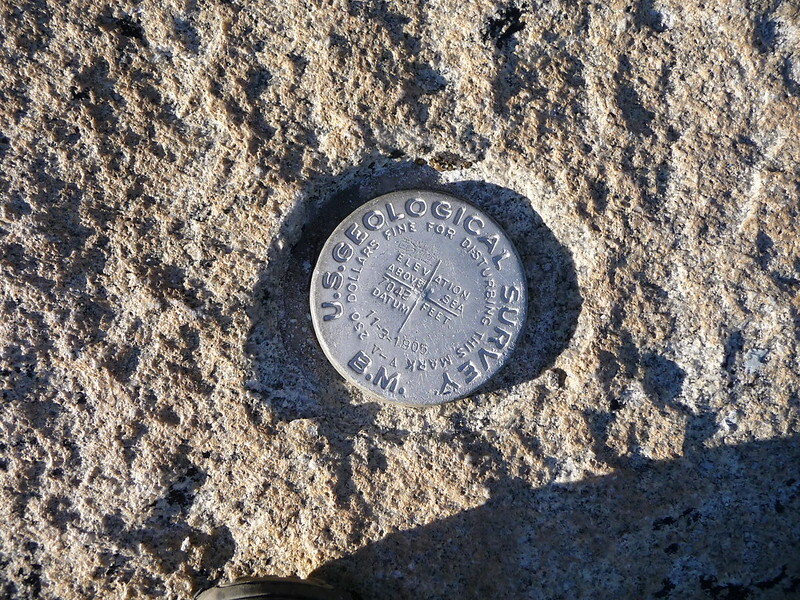 It also shows a benchmark on the summit with an elevation of 7564’. Here is a link to the USGS report that includes this map and a couple of others as well as lots of great photos and information. Edited 1 time(s). Last edit at 02/26/2018 07:08PM by amygdaloid. edit: oops... sorry... THANK YOU FOR THE LINKS Love it! Edited 1 time(s). Last edit at 02/26/2018 08:25PM by chick-on. How long/difficult is the hike up there? Where is the start of the trail, down in the valley or someplace else? The only hike I've done in the park started at Glacier Point and went over to Nevada Falls, Vernal Falls and back through the Valley to Camp Curry. Looks like I hiked past a bunch of the BM that day, but I wasn't looking for them in those days unfortunately. That was over 20 years ago! Would it be ok if I use your photos once I get the keychain done (on the website page for the keychain)? I can credit the photos to you if you want. Thanks again for posting them. If you want to repost those or the other one... go for it. I looked into that 3D modeling thing a bit... but didn't get very far. Whenever you get the final product... would love to see it! 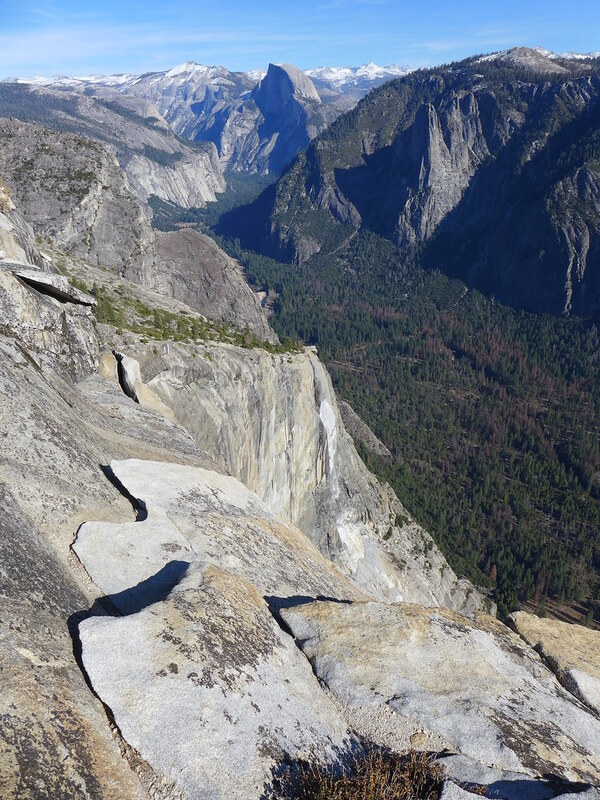 Is there one at Half Dome? Is the Kibbie Ridge boundary one the one at Mercur Peak? Or is that the one that's right on the trail before that dry dusty climb of like a 100' before you hit Sachse Spring? I just called it that... I presume that there are over 140 markers similar to bench markers around the park. They are marked with "Yosemite National Park" "Boundary" and then either "Post No. #" or "Mark No. #". The "HETCH" one is no longer "viewable" without a shovel and maybe a metal detector. The road was redone years ago and was raised. There is a photo of where it is suppose to be. Also added Whitney ones. Pretty interesting that there is a "Division of Highways" one up there. At one time, there was thought of building a road to the summit of Mt. Whitney, a là Pike's Peak. Fortunately, it didn't come to fruition. 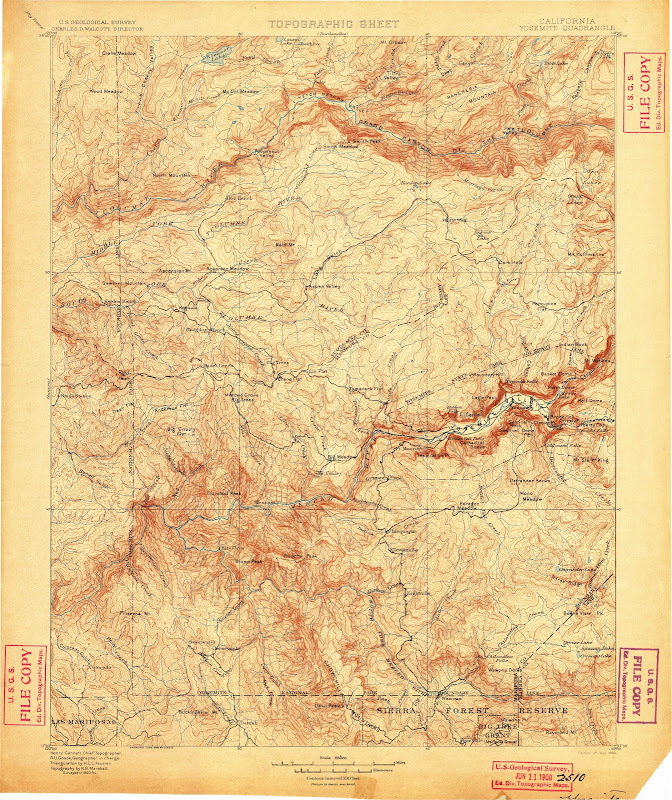 Studying the old topo maps of Yosemite now online from the USGS, I'm wondering if you have come across any boundary benchmarks of the original 1890 boundaries of Yosemite National Park. I don't know if they took the time to place any before the boundaries were changed in the early 1900's. Many of those Old Topos were/are available at the berkeley site. But many also are not. Awesome they are doing this. Hopefully they put up various Mt. Lyell Quads too. In 1906, the boundary of Yosemite National Park were changed. 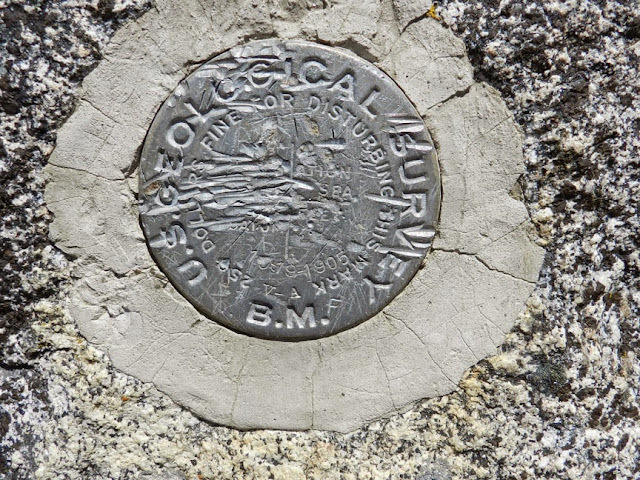 Were the 1906 boundary markers you found from the original Yosemite National Park boundaries, or from the new boundaries that took effect that year? The markers mark the boundary of the current Park. Certain of that. However, point me to the exact maps you are looking at so I can see those maps. The map from Princeton shows the boundaries from many years. 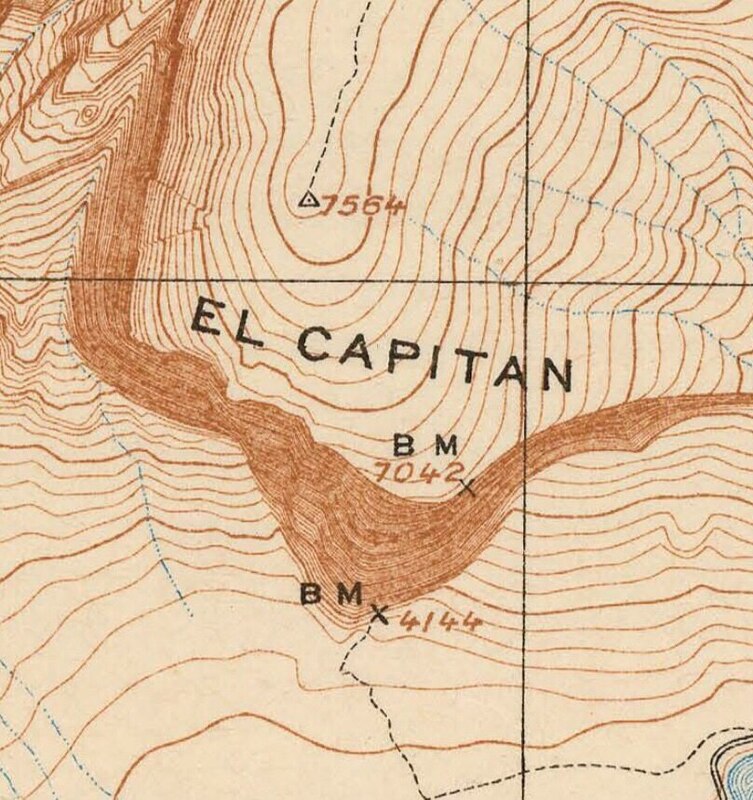 Here's a image of the May 1900 topo map of the Yosemite 30' Quadrangle I was referencing. This maps shows a good portion of the original western and southern boundary of Yosemite National Park. Edited 1 time(s). Last edit at 11/08/2011 11:39PM by plawrence. able to snaggle the Princeton maps in their entirety. Unfortunately not so. The map you show has pretty much been in the Chick-on set since putting it up. The answer is the same... the boundary markers are along the current border. "Forget Geocaching, Bench-Mark Hunting Is the New Nerdy Hobby"
Thanks for sharing this. Fun hobby for sure. Now there needs to be BM reset teams. So many have been destroyed, lost (e.g. base of El Cap) or stolen (e.g. Eagle/Clouds). From reference mark #2 pictured the benchmark itself should be almost due north 5.85 meters (in the direction of the arrow). So when benchmark hunting, be sure to get the actaul benchmark! May give you yet another reason to go up Clouds Rest! The Clouds Rest Triangle one... that one is not there. Just a nub. That's the problem..I think that some people are willing to risk the $250 fine to take a mountaintop souvenir. A $250 fine...have you ever seen the Geodetic Survey police hanging around summits waiting for benchmark thieves? And nubs don't make for very cool pictures! I'm actually quite surprised so many are in decent shape. I actually have al the ones I have in a set if there is any desire. Kinda figured this would go over as well as the Roadside Makers.. It's EAST of Kibbie Lake up on the ridge (take a lookie at a USGS map). Hah, you know me too well. I couldn't resist chiming in on Kibbie. I do love that area of the Park. And these markers were used to mapped the country. Since everything has been mapped, there's no need for them to replace missing markers or add new ones (i.e. on Half Dome). By the last NGS "data sheet" report (2006) both of the "reference monuments" (RM1 & RM2) were still intact as was the "triangulation station" (not a "benchmark" but they mentioned the main station appeared to be aluminum (rather than brass or copper) and that the stamping was obliterated. It was originally monumented in 1905. I got the two Clouds Rest markers and posted the pictures in my album. But still have not heard a definitive answer on Half Dome. Is there one up there somewhere? Hmm, the travails of date sequencing instead of conversation threading. Thanks Chick-On. I should have realized you would have known and answered the question. Somehow I missed it. Is there a story on why there isn't one on Half Dome? Did someone steal it? I could see that it could be stolen multiple times as a souvenir so maybe Yosemite decided to just not place one. What is funny about that though, is if you were showing it off to anyone that cares (a legitimate hiker or backpacker) they would be the one mostly likely to report you---I know I would. Is there a story on why there isn't one on Half Dome? Is there a story about why there should be one on Half Dome? Edited 1 time(s). Last edit at 09/07/2011 09:13AM by szalkowski. I don't know. Every REI I go to has one so I figured Half Dome deserves one also. Yes, Mt. Washington has one labled 6288.176'. Makes one curious what standard is used for sea level where they measure in increments to 3 decimals. Out of state markers are more than welcome. FYI, I recently read an article in "Backpacker" magazine about a rescue from this very mountain. Two unprepared hikers almost froze to death. Have you ever seen any photos of the rime ice that builds up there? Between that and 100mph winds, I wouldn't begin to go up there without proper clothing and gear. There's some kind of club for those who have done it and survived it, but I can't remember the name of it. Half Dome doesn't have one because it was too hard to get on the top of in 1905 (when the one on Clouds Rest was monumented). Back in the day these "triangulation stations" were sighted from numerous other stations and had many horizontal angles turned between them to establish their horizontal location. A lot of prominent peaks have them but they needed to be accessible and needed to have views of other peaks to continue the chain of these surveys. I've always been interested in finding the oldest benchmarks I can. On the way up to the Mariposa Grove, the current road passes close to the original 1864 Yosemite Grant boundary, and there's a benchmark off the side of the road that is dated 1902. Has anyone ever seen one with an older date than that? Also, if you look at a 7.5 map you'll see the orignal boundaries of the Yosemite Grant for both the Valley and the Big Trees. I noticed that todays Wawona Road passes right near one of the corners, and so I located the corner benchmark mounted on a 6-inch pipe that sticks a few feet out of the ground in a road cut. The interested thing is that you have an 1864 "corner" in a 1930's roadcut, but the benchmark had a date from the '50's (or close to that.) I would like to find the other 3 corners of the Big Trees grant. 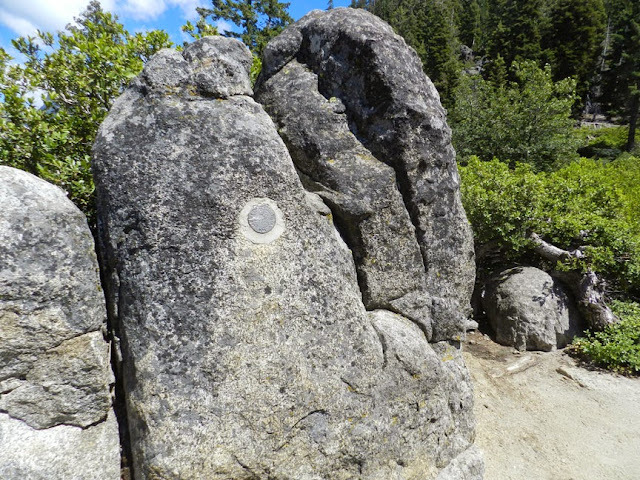 Supposedly, the Yosemite Grant corners that weren't peaks were marked with rock cairns. Another fun one is up at the Great Sierra Mine near Gaylor Lakes. There's a cool old Iron Cross looking marker, with an "M M" stamped on it. I believe this stood for Minerals Management, and it was used to survey to your mining claim. I was unable to find anything really on Illiouette Ridge or Boundary Hill w/r to the Yosemite Grant. Been meaning to finally get to Indian Rock (not the Arch) to check that spot out. Thanks for the info. I'll have to look at pix I took the one time was up at the Great Sierra Mine. Edited 2 time(s). Last edit at 09/07/2011 10:36AM by chick-on. Thanks for contributing. I'll try to add a few of my own, and hopefully others will find it interesting enough to add some from their journeys. I keep finding a couple here and there in albums... there's 110 photos in that set now. Prolly too many to paste here. Watkins marker: 8235'? I have been looking at the wrong place for sure. Many of these things are put in places that are either unexpected (Watkins high point is 8500') or at a spot I prefer not to go (Yosemite Point rail corner). I missed that one... only one I found was marked "US GENERAL LAND OFFICE SURVEY - 1924"
Supposedly, the Yosemite Grant corners that weren't peaks were marked with rock cairns. Edited 2 time(s). Last edit at 09/24/2011 12:22PM by SierraGold. OTOH, what do you think of the possibility that a few people are putting them up with the intent on leading people the wrong way? *shrug* I suppose anything is possible. Here's one from a fourteener. Edited 1 time(s). Last edit at 10/03/2011 05:54AM by szalkowski. How many people reach Lassen annually? Is there a book to sign up there? You guys are sharing some cool markers. Rarest one I can share is measly Basket. Edited 1 time(s). Last edit at 11/13/2011 11:02PM by Ohnivy-Drak. A Zillion. There's no registry atop it. Edited 2 time(s). Last edit at 11/13/2011 09:38PM by bill-e-g.
A group of people should buy one of those, then hammer it in where it's supposed to go. After a few years in the elements, maybe it won't look as shiny. Although I don't like the fact it doesn't have the "$250 dollars" warning on it. Edited 1 time(s). Last edit at 11/13/2011 10:47PM by Ohnivy-Drak. A group of people should buy one of those, then hammer it in where it's supposed to go. I would think this is an activity that a Clamper might take on. Edited 1 time(s). Last edit at 11/03/2011 12:06PM by plawrence. Awesome! Thanks for the contributions. Depending on location, some of these might be worth saving into GPS. I've noticed that a few don't show up on the list until/unless you are closer to the Park. "Top of El Capitan" shows up from 200 miles away, but a place like OM! point doesn't. Edited 1 time(s). Last edit at 10/27/2011 10:55AM by Ohnivy-Drak. Edited 1 time(s). Last edit at 11/16/2011 09:05AM by hikerchick395. Chick-on sez dat berry kewl. And no think it the most boring topic eva. I'm assuming there isn't one at North Dome or in the Elizabeth Lake area? If the weather remains decent, The hubby and I are planning on hiking both next week. I like the idea of trying to find as many of these as possible. Our uncle owns a land surveying business back in Ohio and loves when we send him pics of markers. Edited 1 time(s). Last edit at 12/23/2011 09:48AM by JRo27. I'm assuming there isn't one at North Dome or in the Elizabeth Lake area? If the weather remains decent,. Not many of the peaks around TM have markers... nothing really near Elizabeth.. You can find some markers along Tioga though. That was so last year. I guess I should go thru last years faux toes and put them together. See file dsdata.txt for more information about the datasheet. 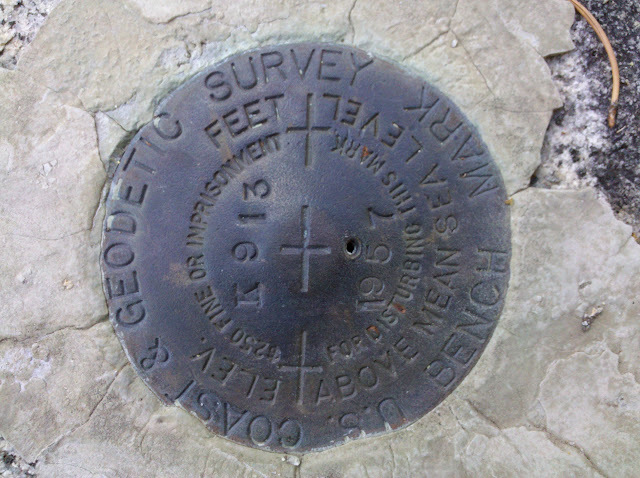 HR2868.and adjusted by the National Geodetic Survey in March 1994. HR2868.The Laplace correction was computed from DEFLEC09 derived deflections. HR2868. The following values were computed from the NAD 83(1992) position. HR2868; North East Units Scale Factor Converg. HR2868.Superseded values are not recommended for survey control. HR2868.NGS no longer adjusts projects to the NAD 27 or NGVD 29 datums. HR2868.See file dsdata.txt to determine how the superseded data were derived. HR2868'STATION MARK--COPPER BOLT SET IN ROCK. HR2868'RECOVERED AS DESCRIBED BY USGS. HR2868'MI E. OF YOSEMITE. ON HIGHEST POINT OF CLOUDS REST. HR2868'AND STATION. A 3-HOUR PACK. HR2868'HOLE IN LARGE GRANITE BOULDER. 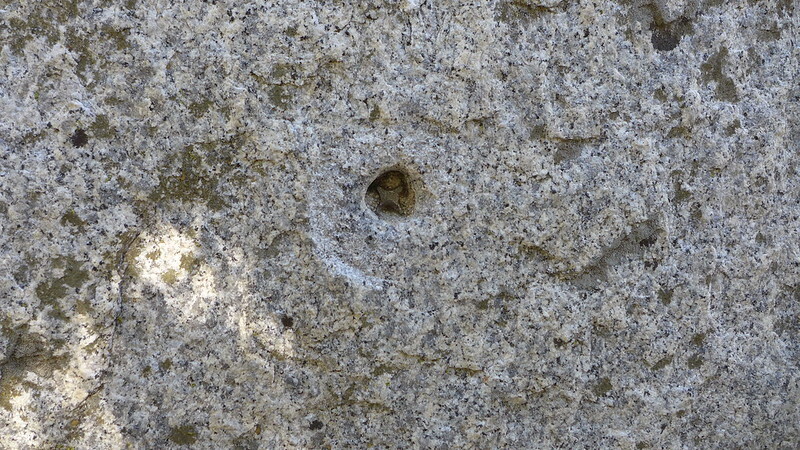 HR2868'HOLE IN TOP OF SOLID GRANITE. HR2868'COPPER, AND THE STAMPING HAS BEEN OBLITERATED. "Obliterated," huh? Data sheet must be referring to that wrinkled up knob? 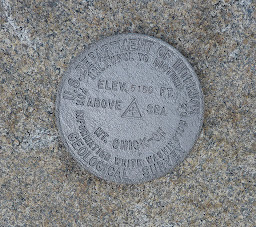 HR2874.and adjusted by the National Geodetic Survey in March 1994. HR2874.The Laplace correction was computed from DEFLEC09 derived deflections. HR2874. The following values were computed from the NAD 83(1992) position. HR2874; North East Units Scale Factor Converg. HR2874.Superseded values are not recommended for survey control. HR2874.NGS no longer adjusts projects to the NAD 27 or NGVD 29 datums. HR2874.See file dsdata.txt to determine how the superseded data were derived. HR2874'SEE 1956 RECOVERY FOR DESCRIPTION. 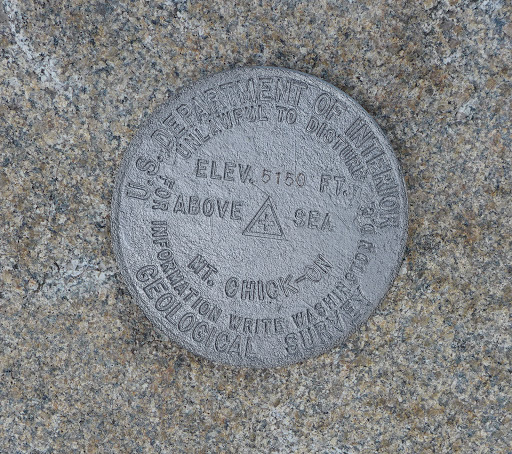 HR2874'STATION MARK--STANDARD TABLET CEMENTED IN ROCK. HR2874'RECOVERED AS DESCRIBED BY USGS. Edited 1 time(s). Last edit at 07/23/2012 07:55PM by Ohnivy-Drak. It's too bad I'm not a geologist because one might be able to make an educated guess based on the granite. Hmm...Mt Williamson. Or let's go with Rocky Point. Now fowl shares 10 new ones. Edited 1 time(s). Last edit at 02/15/2013 10:24PM by Ohnivy-Drak. What are you saying? That he doesn't travel in first class? Is this one of the benchmarks on the park's western (or former western) boundary? Possibly where the old Coulterville Road entered the park? Next peak down from Mt. Photoshop? That's the best you could do? Maybe it's close to Mt. Bouillon? Crazy, eh? I was still half asleep. Begs da ques-shun... ewe catch the one on Sentinel too? And why not ewe post faux toe of full moon? Must have got one, no? Maybe it got to be overcast at Taft Point that evening. Didn't take one. Was tired. HR0762'4.2 MI W FROM EL CAPITAN RANGER STATION. HR0762'OF A 48-INCH CEDAR IN A CLEARING. HR0762'ARRANGED TO MAKE A SMALL FIRE RING TOWARDS SOUTH END. HR0762'MARK IS JUST EAST OF NORTHEAST CORNER OF AREA. HR0762'RAN INTO THIS FLAT AREA. HR0762'SLIMMER, TALLER CONCRETE WITNESS POST VERY CLOSE BY. HR0762'AND 10.7 FOOT ERROR ESTIMATE. HR0762'POSITION, WHICH IS ACROSS A SMALL WASH FROM ACTUAL LOCATION. Edited 1 time(s). Last edit at 04/18/2013 08:31PM by basilbop. As soon as the road was shut down for good, neither ranger station had any reason for existence. Did you have to go poo on it? Definitely not gonna chew on it now. I was so excited I couldn't help myself. There was also a faint orange circle around the STA 1 marker. Does anyone know if there are any other benchmarks in this 1949 STA # series? I thought it quite strange to see this orange stuff at Maclure. Such a lovely lake. that area when came over Hell Hole and up Lyell in 2010 (where does the time go) sheesh. I stumbled upon a benchmark on our way back from our failed Basket Dome attempt. 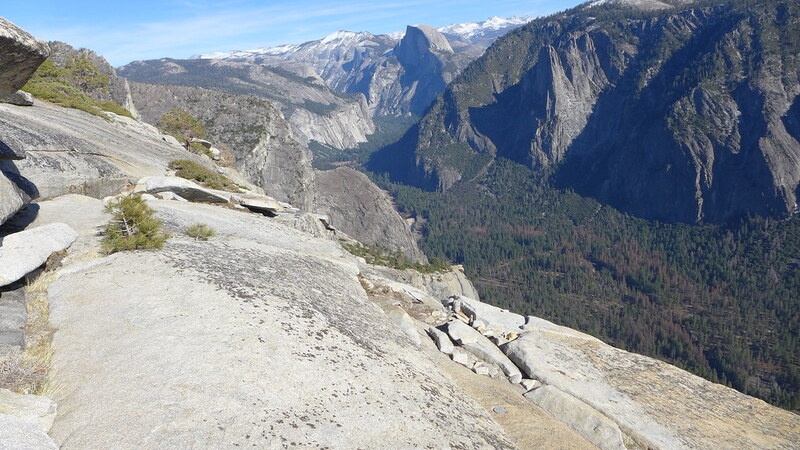 It's located on a rock where the four trails intersect; to Tioga Rd, to North Dome, to Snow Creek, to Yosemite Falls. I should have taken a picture but I was too tired to think about by that time. The maker is so corroded and pitted that it is mostly unreadable. I think the date was 1905 but I'm not 100% sure. Anyone seen this one before? Oops, Union Point wasn't mentioned by name in this thread but it's in the other collection that chick-on links to, here. You'd be surprised at how many "benchmarks" are set in vertical features (bridge abutments, rock ledges, etc.). Quite of few of the monuments that are pictured in this thread aren't really "benchmarks" but are "triangulation" stations (horizontal coordinates only, not vertical). At the bottom of a certain set of cables was a rather appropriate spot for this. Monument Peak, Fremont/Milpitas area. Not difficult to obtain.